As usual, we went for an early morning walk at the beach which was once again on low tide. We packed our bags as we were to leave Havelock that morning. 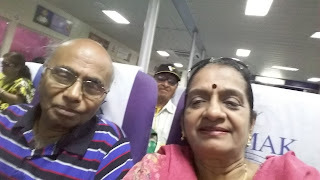 We were to return to Port Blair with just a stopover at Neil Island. We were under the impression we were to disembark at Neil. 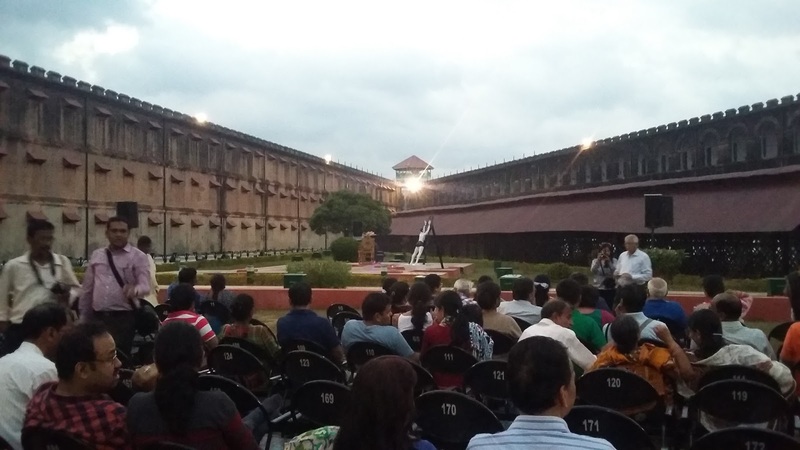 But it was not to be as we had to visit Cellular Jail in the evening. We were sort of disappointed. We were all seated comfortably for the 40 minute ride to Neil. But eventually it took almost double the time. And the last half hour was a very BUMPY one! Suddenly people started doubling up, bending over, gasping, controlling the urge to puke even as they gesticulated for 'puke-bags'. The crew was ready with paper bags and napkins and assistance to the needy. It was funny ( was it?) to see the youngsters more affected than the seniors. Those unaffected included us as well as the oldest members of our group. We just shut our eyes and tried to relax through the turbulence as everyone hoped it would end soon. We reached Neil Island at 11.40. Some disembarked, some boarded, some remained seated. 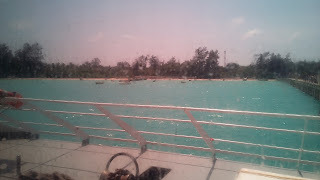 After 20 minutes, we started our ride to Port Blair. We were keeping our fingers crossed that the mini voyage would be better now. And it was - but not as pleasant as our onward journey. All passengers had been battered physically, mentally and emotionally - in fact we did not regret we didn't get down at Neil! We were glad to reach Port Blair in another 75 minutes. We boarded the bus and reached Megapode Restaurant in five minutes. We freshened up and sat down to lunch. It was 'Chathurthi', so Kaustubh had earlier placed an order for 'sabudana Khichadi' for those on fast. 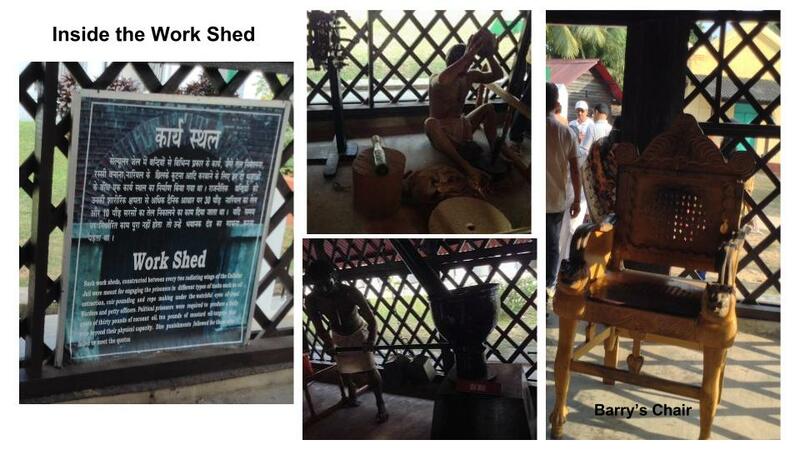 He had warned us not to expect typical Maharashtrian 'Khichadi' as the chefs there were not used to it. Man, it was something totally different - runny, yellow, with very little groundnuts ...... Anyway, all of us were not in the best of our appetite, so no issues! We were rather happy to relax, enjoy the cool breeze and take in the breath-taking views around ... till 3. Rejuvenated, we were geared up for yet another scintillating experience. 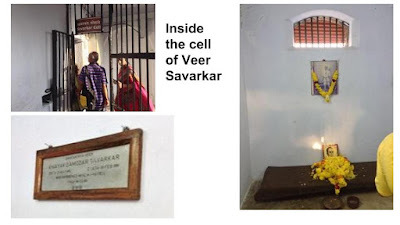 It was 26 Feb, the death anniversary of Veer Savarkar and our Tour Managers had planned for the visit to Cellular Jail on this special occasion. Everyone was brimming with excitement when we reached there at 3.30. This National Memorial stood majestic even today. As we entered, the three wings of the (in)famous Jail majestically welcomed us. Our guide Mr.Shibu joined us and gave a graphic account of the place in impeccable English and Hindi. whiplashes / fetters / punishment dress which would be itchy. Originally there were seven wings with the watch tower at the center. Four wings had been badly damaged due to bombings during World War II and they were razed to make way for new constructions in the 60's. The tiny windows of the two-storeyed wings were positioned high. Also windows of no wings faced each other. So the convict in each cell had no chance to even 'see' anyone. 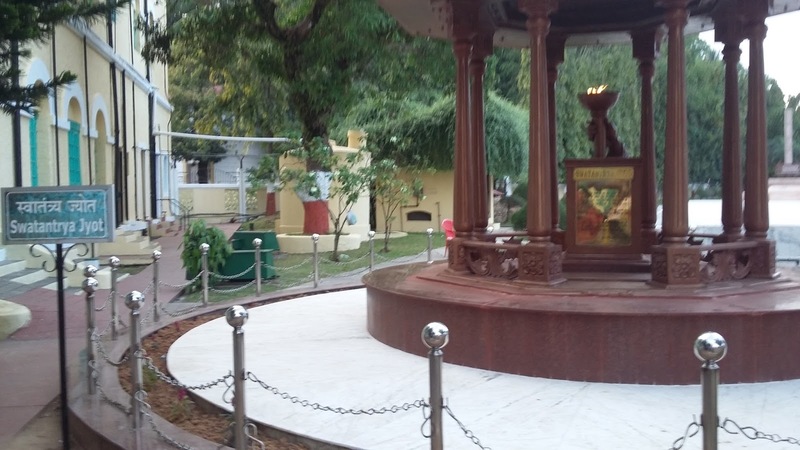 It is said Veer Savarkar lived for years there without knowing his brother was there too! The latch was sooo long that it was impossible for a convict's hand to even attempt opening it. 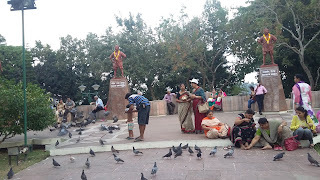 It was Savarkar's death anniversary and our Tour managers had coaxed us to be ready to join the chorus as they presented the songs 'Jayosthuthe' and 'saagara ...' as a tribute to Veer savarkar. Other tourists listened in rapt attention / joined us. All of us paid respects to Savarkar as we entered his cell - the last one on the second floor. Yes, even the oldest members of our group made it. From there we went right to the top - to see the watch tower. The view from there was breath-taking - now. Earlier the merciless guards wouldn't have cared for the scenery! We also got to see the G.B.Pant Govt. 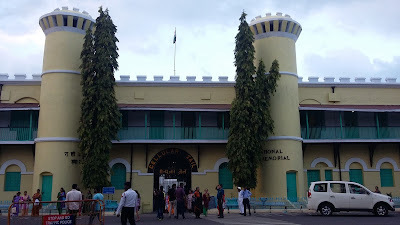 Hospital constructed in the place of the dilapidated wings of the Cellular Jail in the mid 60's - as I have mentioned elsewhere, my father, as the Principal Engineer was in charge of the project. We thanked our Guide Mr. Shibu for our wonderful experience. We had a group photo clicked before we were forced to vacate the place at 4.45. 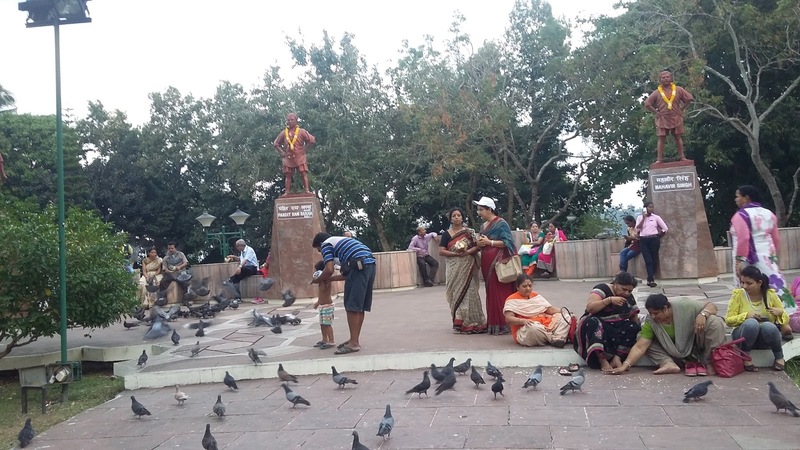 All the tourists crossed the road and settled themselves in and around Savarkar Park. 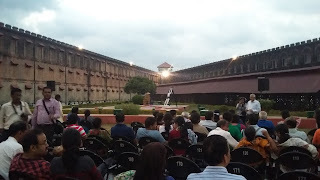 We had to spend an hour before re-entering Cellular Jail for the 'Light & Sound Show' from 6 - 7 pm. The sun set at 5.30. We showed our tickets and were allowed inside. .... we took our seats. The Show started at 6. 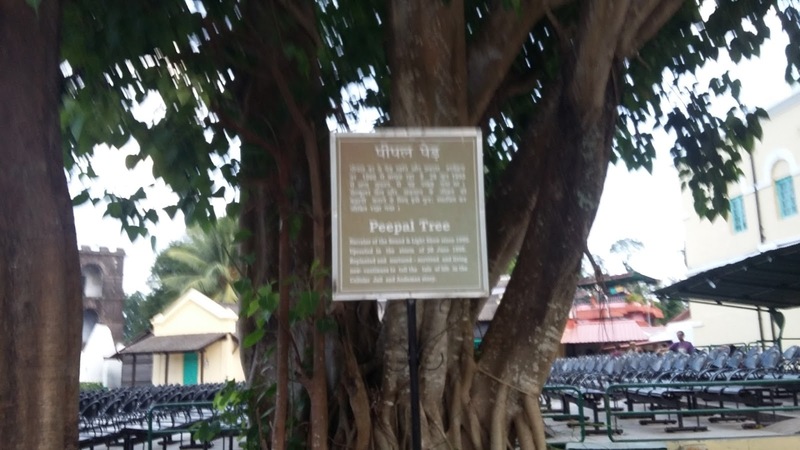 The narrator was the 'Peepal' tree. Photography was prohibited. So everyone enjoyed the show without distractions. Not much of 'show' ; more of dialogues / narration with a spattering of lights. I liked the tri-color lights on the three floors of each of the two wings. The visit to Cellular Jail was definitely the highlight of the tour for all. We returned by bus to our earlier resort 'Rose Valley'. This time we were allotted a different set of cottages. Ours was 120 , named 'Barren'. We freshened up and went to the dining hall for dinner; the day's special was a coconut-based Nicobarese dish - which tasted somewhat like 'Avial'. We called it a day as early as 9 pm. Next day's agenda was visit to Jolly Buoy Island.